This is the best and most complete scroll saw video ever. Rick starts with an overview of the many types of simple to complex projects and gives sources for hundreds of scroll saw patterns. 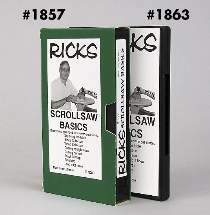 Rick introduces the major types of scroll saws, how they work, and the advantages of each. He then takes you through dozens of little known techniques including a very easy way to square your blade, secrets to making your saw do what you never thought it could, and which saw accessories you should consider purchasing. You will learn what types of blades are available, which blade to use with different thicknesses of hard- and softwoods. You will learn how to control the wood to cut rapidly yet stay on the line and never experience burning. This video shows dozens of little known techniques you can use immediately on any saw. You will learn the best techniques, shortcuts and secrets. Highly recommended. 60 minutes.